For the fifth year in a row, I’ve been part of a collective to create a summer reading list for children and teens, ages 0-18, that highlights IPOC (Indigenous and People of Color) authors and illustrators and their diverse, inclusive books. Diverse and inclusive means we pay special attention to books with LGBTQIA+ and disabled protagonists of color, because identities are not one-dimensional. For the past year, the members of the collective — Tad Andracki, Edith Campbell, Laura Jimenez, Sujei Lugo, Debbie Reese, and Sonia Alejandra Rodriguez, and myself — read dozens of nominated books and discussed them online and during regular meetings via Skype. Our standard was books that we would recommend to any child, keeping in mind age appropriateness. Each book had at least two readers, who examined them for inclusion and freedom from microaggressions. In past years, our book list came out under the name We’re the People Summer Reading List (and you may view past lists at the end of the 2018 post), but we changed our name this year to facilitate a Twitter hashtag (We’re the People was already taken) and because we wanted to expand our mission beyond annual book lists to include discussions of classic titles and other topics related to diversity and inclusion in children’s literature. Unlike last year’s list, which didn’t include 2017 titles because several of our collective members were on award committees, this year, we had no such restrictions. In fact, ten of our books on this year’s list are from 2017, slightly fewer than 2018 titles. Not having the latest books last year prompted us to include a number of older books that needed to be rediscovered. 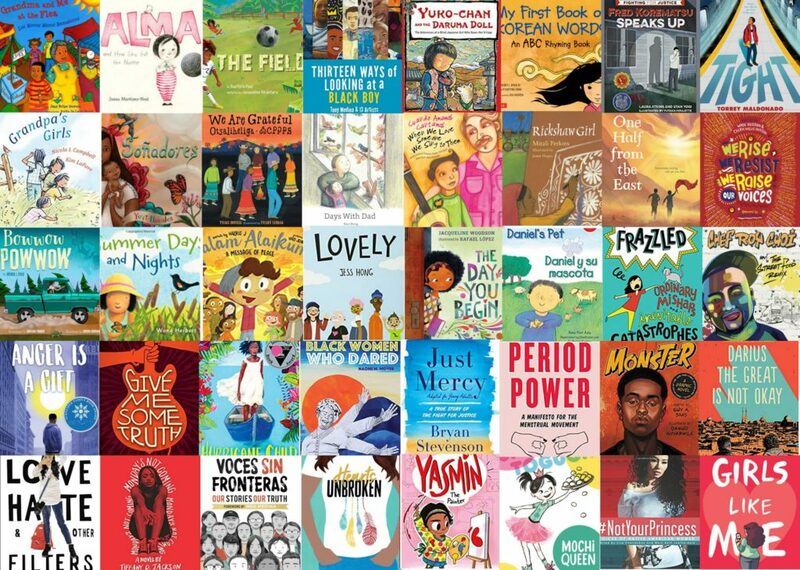 This year we also include older books, one from as far back as 1990 (Rosamund Elwin, Michelle Paulse, and Dawn Lee’s Asha’s Mums), but the increase in books with IPOC characters by own voices authors and/or illustrators in the past several years has led to a stronger presence of recent books on the list. 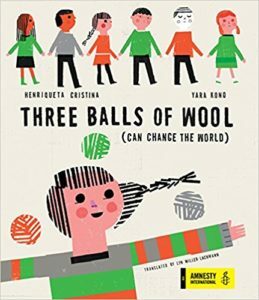 One of the outstanding features of this year’s list is the number of bilingual books and the range of languages represented, especially in the picture book and beginning reader categories. Among these are Nicola Campbell and Kim LaFave’s Grandpa’s Girls (English/Interior Salish language); Brenda Child and Jonathan Thunder’s Bowwow Powwow (English/Ojibwe; translated by Gordon Jourdain); Juan Felipe Herrera and Anita De Lucio-Brock’s Grandma and Me at the Flea/Los meros meros remateros (English/Spanish); Ernesto Javier Martinez and Maya Cristina Gonzalez’s Cuando amamos cantamos/When We Love Someone We Sing to Them (Spanish/English; translated by Jorge Gabriel Martinez Feliciano); Sunny Seki’s Yuko-Chan and the Daruma Doll: The Adventures of a Blind Japanese Girl Who Saves Her Village (English/Japanese); and Traci Sorell and Frané Lessac’s We Are Grateful: Otsaliheliga (English/Cherokee). Along with three bilingual English/Spanish titles in the beginning reader category, we included My First Book of Korean Words. 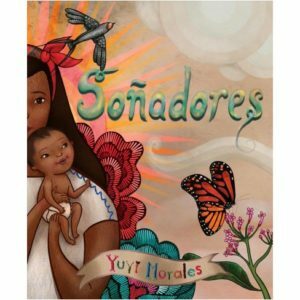 In addition, Nari Hong’s picture book Days with Dad was translated from Korean, and we recommended Soñadores, the Spanish edition of Yuyi Morales’s award-winning picture book Dreamers. As a result, this list is a great way to introduce young children to new languages, an increasingly important skill for people in the United States to have. In all, the list features 16 picture books, 10 books for beginning readers, 14 middle grade books, 12 young adult books, and one article for teen readers, a December 2018 Teen Vogue piece by Jenn M. Jackson titled “People of Color Deserve Credit for Their Work to Save the Environment.” We did not select any adult titles suitable for teen readers this year, though Bryan Stevenson’s Just Mercy: A True Story of the Fight for Justice is an adaptation of his acclaimed nonfiction title for adult readers Just Mercy: A Story of Justice and Redemption. 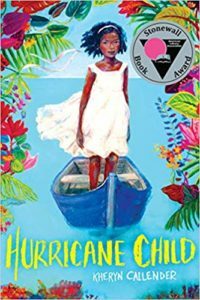 Intersectionality is an important component of each of our lists, and among the standout titles are the winner of ALA’s Schneider Family Award for disability representation in 2019, Mark Oshiro’s YA novel Anger Is a Gift and Stonewall winner for LGBTQIA+ representation in 2019, Kheryn Callendar’s MG novel Hurricane Child. For the entire list of 52 books and one article, visit the We Are KidLit website, or download a printable PDF here. We look forward to your comments and thoughts on books to look for next year! Happy reading! Thank you, Lyn! I have read that we are experiencing the “Third Golden Age of Children’s Literature” and your Award confirms this movement toward expansion and inclusion. Thank you, Barbara! The CCBC statistics on more diverse IPOC representation are encouraging, but we still have a long way to go, especially in making sure IPOC book creators are the ones getting published instead of already privileged and successful authors writing outside their lane. The Summer Reading List features own voices authors and/or illustrators for this reason. And as far as international authors, we do have several, from Mexico, Japan, and Korea, this year. There was conversation here last year about the erasure of Jewish content from the 2018 list. After a year of surging anti-Semitism around the world and here, as well as the Tree of Life massacre in Pittsburgh, what’s Jewish-themed books on this 2019 list? There’s a big discussion on Twitter about that now. I don’t think teachers and librarians should restrict themselves to one list, and I’m glad to see people putting together other lists that include Jewish-themed books, selected by people who are specialists in that area. So even after last year’s call-out of this problematic aspect of the list, there is zero Jewish content on this year’s list. Wow. Just wow. Just…wow. Calling this list diverse is gaslighting. Full stop. Thank you for this post, Lyn! It’s nice to have everything in one place for quick reference. Thank you! We seem to be getting a lot of interest. Our Twitter announcement has had about a thousand likes and retweets.